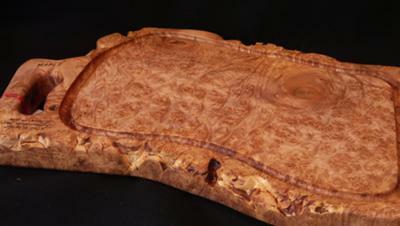 big maple burl wood chopping board--big size, good design. Do you have any photos of cutting/chopping boards made from the aforementioned wood, what is the largest size of either type wood chopping board, and what would said price be? Great idea to share tips on this. So I'll set up that title and see what comments we get. DIY-or 'do it yourself' for just about anything these days is the biggest trend on the rise. Between out of reach professionals rates or the a genuine lack of said professionals at our disposal, more and more people are rolling up their sleeves and doing it for themselves. Simple antique clock repairs, house painting and wallpapering--just about any manner of fix it now and save a bundle application is being taken into hand. Youtube and other websites offer fantastic streaming footage to aid the home handy person in getting their start. Ron (at *Arbutus Arts*) and other such wood specialists are the perfect go-to guys to purchase your initial specialty wood products from. Ron and related specialists will always stand by their products with quick accessable DO IT YOURSELF education regarding general reparation and related maintenance care in their specialty crafted wood products. It's that extra guarantee of quality assurance you get when you buy from the very best. I baby all my boards with a regular mineral oil bath that is all carefully hand-rubbed into the board. The boards now have a lovely patination from keeping this up over time. One board I've had since I was pretty much a kid is now developing a small running crack with age (from age related internal dryness of the board). I propose we start a forum on how to thwart/repair (wood) chopping & serving board cracks when they are still relatively new--verses not having the crack 'travelling' or 'spreading' the length of the entire board and therein ruining it permanently. This reparative topic could be addressed by all members in a clear, stage-by-stage instructive narrative with FOOD SAFE applications on how to apply the needed corrective measures. Maybe things like matching fine sawdust particles could be applied into the would-be foodsafe glueing agent so that the repair will be more aesthetic and less obvious to the eye perhaps? What needed prep would be necessary? How would it be applied therein? What method of repair is the most non-toxic? What repair will stand the test of time and everyday functional board use? Unfortunately it is real hard to find such a big piece of burl in Arbutus and even harder to find it without cracks. Arbutus or Madrone burls crack lots when they dry. I'll keep my eyes open though for you. I found a giant dead Arbutus tree and will be bringing it in this winter. Perhaps it will have a piece.